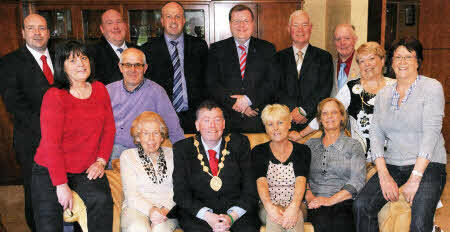 At the final meeting of the Mayor's Charity Working Group on Tuesday May 24 are L to R: (front two rows) Valerie Martin (Secretary), Joe Tumelty, Stella Stewart, Councillor Paul Porter (Lisburn Mayor), Anne Blake (Chairperson), Jacquellne Wood, Iris Baxter and Gloria Smyth- (back row) Councillors Paul Stewart, William Leathern, James Tinsley and Jonathan Craig MLA and former councillors Ivan Davis and Cecil Calvert. FORMER Lisburn Mayor Alderman Paul Porter chaired the final monthly meeting of the Mayor's Charity Working Group on his final day in office on Tuesday May 24. During the meeting Anne Blake, Chairperson of Carers Forum on Learning Disability halted the proceedings to say a very special 'Thank You Mr Mayor' to the Mayor and his staff for all their hard work in organising the many successful fundraising events held in support of his chosen charity.